Last night, I wasn’t feeling very happy so David took me on a date to Oregano’s and then to Chronicles of Narnia to cheer me up. He’s so great. I go through spurts in liking Oregano’s. 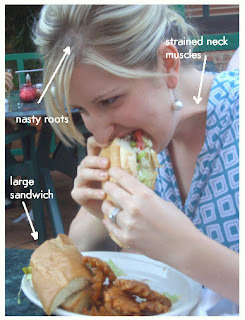 The first time I went, several years ago, I got the “Veggie Wedgie” sandwich. It was pretty great with roasted eggplant, mushrooms and some other veggies on Foccacia bread served with herbed waffle fries. I liked that. The last time I went, the food was mediocre and the Pazookie was overcooked – a huge problem with me on the dessert front. I left Oregano’s well enough alone for a while, choosing Flancer’s for a good sandwich and forgetting about the Pazookie altogether (almost). But last night, we decided to give Oregano’s another chance. I ordered the turkey sandwich with peppers, onions, olives and provolone with Italian dressing. It was delicious – just what I wanted, comfort food. However, it seems that during my Oregano’s hiatus, I forgot about their generous (edit: ridiculously huge) portions. Biting into my sandwich rather strained my neck muscles as seen here. Oh, and I think my TMJ is getting worse. David ordered pizza (FYI: If pizza is on the menu, David will order it) – one cheese and one pepperoni. That silly boy – he just LOVES pizza. 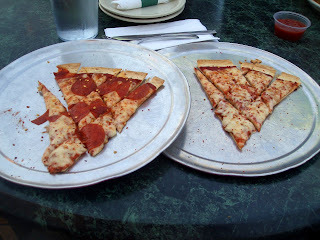 He ordered two kid’s size slices since he had eaten an afternoon snack. I think he wishes he had ordered an adult pizza. Then, since my sandwich was giant, I had our server pack up the other “half” of it. Once we reached the movie theatre, I went to the bathroom and remembered that we left the Styrofoam carton on the table as we left through the back gate! I politely asked David to return to the restaurant (now almost 15 minutes away) and ask if they had saved my leftovers. Instead, he gave me a big, fat no and now I’m still a little upset because I have no lunch today. The worst part? It would have made excellent leftovers. That’s what I get for being a little piglet, I guess. I could seriously go for some Oregano action right now! Liz- Don't know if you remember me from high school, but I just have to tell you I love reading your blog. I always end up stumbling across it and then just get locked into reading. ;) I've finally just linked you on my page.